Three miles south of Crieff the dead straight A822 makes a sharp zig-zag through a village built mostly from a reddish stone. Welcome to Muthill, pronounced "Mew-thil". Early settlement in the area owes much to the Romans' brief occupation, and this seems to explain the straightness of the road from Crieff, and the straightness of another minor road which heads south west from the village to meet the A822 at Springbank before continuing past Ardoch Roman Fort towards the A9. Muthill itself was founded by Céli Dé or Culdee monks who had established a community here in the 1100s. The name comes from the Gaelic word "Maothail". This is said by some to translate as skin softening and to imply that Muthill was seen by the Culdees as a comfortable place to be based. Given the agricultural richness of the area, the proximity to good routes across Perthshire, and the handiness of the River Earn, which passes by just over a mile to the north east, it is easy to see why this might have been considered to be a favourable location. The oldest building in Muthill, by far, is the tower of the Old Church. This probably dates back to the 1170s and would originally have been a free standing tower designed as much for protection as for worship. The tower has many similarities with others from the same period at St Rules Church in St Andrews and St Serfs in Dunning. 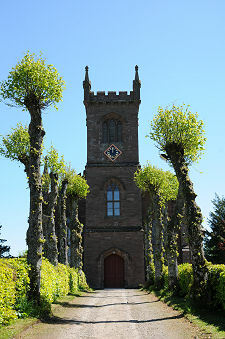 The tower at Dunblane Cathedral was probably also very similar to Muthill's before it was enlarged and incorporated into the Cathedral itself. A church may have stood here previously, but the ruin of Muthill Old Church you can see today dates back to the first half of the 1400s. From the graveyard you can see the Gothic-styled parish church that was built in 1826 by the Presbyterian arm of the church after the site of the original 1400s church came under the control of the Episcopalians. The designer was James Gillespie Graham, and it is easy to see in Muthill how he came by his nickname of "Pinnacle" Graham. James Gillespie Graham may also have been responsible for another building in the village. Hiding behind a tall hedge at the south end of Willoughby Street, where it curves round to face across to Highlandman's Park, is a cottage that comes complete with all the adornment you'd normally expect to find on a castle. The Episcopalians wanted to build a new church on the site of the old, but faced objections from residents whose relatives were buried there. They chose instead to abandon the old church and build a new one, which explains why Muthill has a third church, almost between the other two. St James, built in 1836, is the oldest Episcopal Church in the area. The name of Highlandman's Park seems to reflect a very dark time in the history of the village. Muthill was largely destroyed in January 1716 by Jacobites retreating after the Battle of Sheriffmuir (see our Historical Timeline). Compensation was paid by the Government, but only in 1778. Much of what you see in the village today dates back to the latter half of the 1700s and the early 1800s, and this gives the village a sense of unity with many houses made of the same stone lining the mains streets. 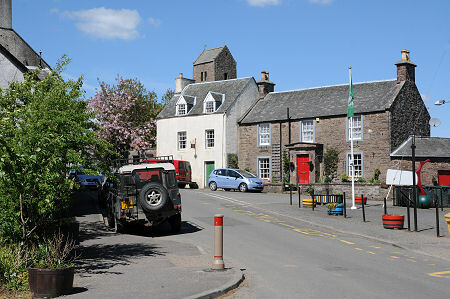 Muthill was designated a Conservation Area in 1974, and over 100 of the buildings in the village are listed. Muthill entered the railway age, after a fashion, in 1856, when Muthill Station was opened on a branch line of the Crieff Junction Railway. The station was actually over a mile and a half to the east, at Caerlaverock, and it seems to have had little impact on the village prior to its closure in 1964. A little north of Muthill is Drummond Castle, ancestral home of the Earls of Perth whose estate included Muthill. However, it was from very much humbler origins, as the daughter of a blacksmith from near Muthill, that a local girl, Helen Gloag, became Empress of Morocco in the late 1700s. While in Muthill, take the time to visit the Muthill Village Museum, located in a white-rendered building backing on to the old churchyard. 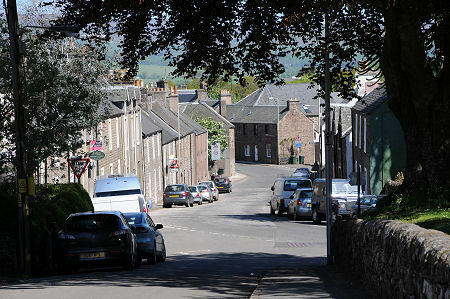 Here you can gain a wider understanding of the background and history of this Strathearn village. The museum stands on The Cross, the broad street that defines the heart of the village and which once formed the market place.